Formerly known as Subtitle Mixer, Subtitle Translation Wizard is an easy subtitle translation tool that has been designed by UpredSun. It offers different features and some of them are detailed below. 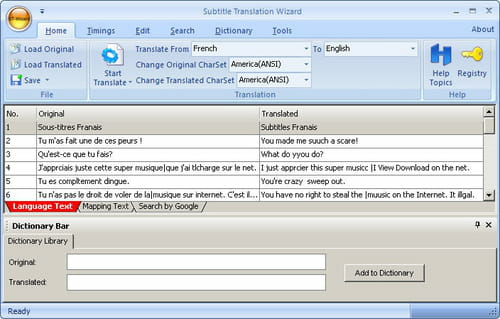 Translate and edit: with a few mouse clicks, Subtitle Translation Wizard enables to translate and edit subtitles. It supports SubRip (.srt), sub (MicroDVD), Sami (.smi) , SubViewer (.SUB) and SubViewer 2.0 formats. Extract and save: Subtitle Translation Wizard allows its users to extract and save subtitle text from both the original and the translated subtitle. Mix subtitle texts can also be extracted and saved. Subtitles can also be merged together. Miscellaneous: supporting different languages, Subtitle Translation Wizard supports the adding of sentence into dictionary. Code schema convert tools as well as a mini study of dictionary are provided. Player: Subtitle Translation Wizard helps users to play subtitle for movie that does not have subtitle. Apart from that, it can also play a subtitle for movie that has subtitle you do not like. Subtitle Translation Wizard is reliable and easy to use. There is a new version available for Mac users. *Features are limited for this trial version. Latest update on April 5, 2018 at 04:29 PM.